alaTest har samlet og analyseret 8 anmeldelser fra magasiner og hjemmesider. Gennemsnitligt vurderede brugere dette produkt til 60/100 og eksperter vurderede dette produkt 77/100. The XYZprinting Nobel 1.0 provides the exquisite quality of stereolithographic 3D printing at a moderate price, although its cost per printed object is considerably higher than objects 3D-printed with plastic filament. High resolution. Exquisite print quality. No misprints in our testing. Can print from a computer or a USB thumb drive. Automatic resin-feeding system. High cost per printed object. Resin and rubbing alcohol are potential irritants and are messy to work with. Spurious error messages. 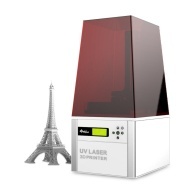 The XYZprinting Nobel 1.0 3D Printer produces highly detailed and complex 3D objects. The compact printer costs significantly less than others that use the same technology and requires little time to set up and operate. The printer and the consumables it uses are expensive. The print process is slow and, due to the nature of the consumables, can be messy. The XYZprinting Nobel 1.0 3D Printer is a fun novelty that is too expensive to be practical in the long run. Stereolithografie is een dure, maar superieure manier om 3D-prints te maken. Met de Nobel 1.0 van XYZprinting kan je dan ook kunstwerkjes creëren. Great product with affordable price.